Therapists usually suggest specific exercises depending on your particular hand or wrist condition. Some help increase a joint's range of motion or lengthen the muscle and tendons via stretching. Other exercises strengthen muscles around a joint to generate more power or to build greater endurance. 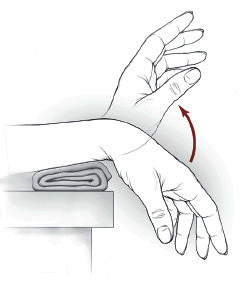 Your muscles and tendons move the joints through arcs of motion, such as when you bend and straighten your fingers. If your normal range of motion is impaired — if you can't bend your thumb without pain, for example — you may have trouble doing ordinary things like opening a jar. 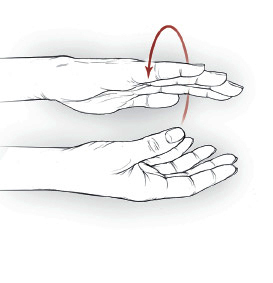 These exercises move your wrist and fingers through their normal ranges of motion and require all the hand's tendons to perform their specific functions. They should be done slowly and deliberately, to avoid injury. If you feel numbness or pain during or after exercising, stop and contact your doctor. • Place your forearm on a table on a rolled-up towel for padding with your hand hanging off the edge of the table, palm down. • Move the hand upward until you feel a gentle stretch. • Return to the starting position. 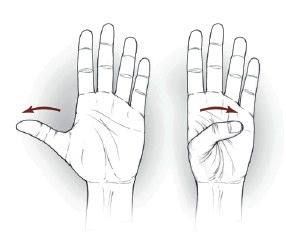 • Repeat the same motions with the elbow bent at your side, palm facing up. • Stand or sit with your arm at your side with the elbow bent to 90 degrees, palm facing down. • Rotate your forearm, so that your palm faces up and then down. 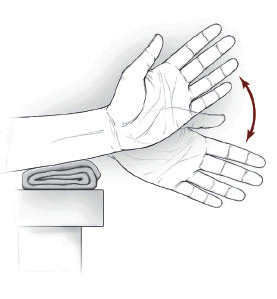 • Support your forearm on a table on a rolled-up towel for padding or on your knee, thumb upward. • Move the wrist up and down through its full range of motion. • Begin with your thumb positioned outward. • Move the thumb across the palm and back to the starting position. • Start with the fingers extended straight out. 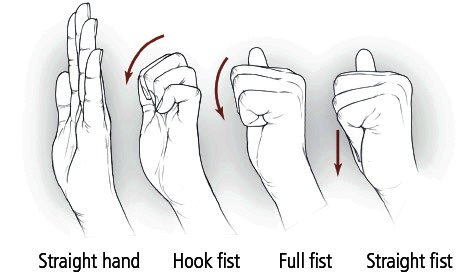 • Make a hook fist; return to a straight hand. • Make a full fist; return to a straight hand. • Make a straight fist; return to a straight hand. For more information on the causes and treatment of hand pain, and strengthening strategies for hands, buy Healthy Hands, a Special Health Report from Harvard Medical School.